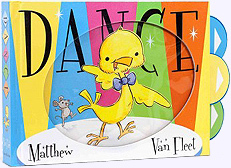 Learn all the moves and dance with this baby chick from Matthew Van Fleet's new, jazzy interactive book. 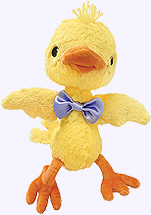 The Chickie Baby Doll's soft, downy fur, snappy satin bow and sweet smile will make your little dancer want to move and groove as you read along about how Chickie Baby starts to dance with all his friends. Cute! Dance Chickie is 10" tall (8" seated). Safe for all ages. Surface Washable. Read and dance along as Chickie Baby learns to dance from a friendly band of animals who know all the right moves. Young readers will delight in pulling the six sturdy pull tabs to make the different animals hop, shake and bop as they dance to the Hippoppta Hula, Gator Mashed Patater and more!